Why does my dock keep moving back to my other monitors? I have a larger, external monitor connected to my MacBook Pro and have arranged it such that the dock is in the external monitor (via System Preferences > Displays > Arrangement, by dragging the white bar to the larger screen). This works fine, except for the fact that every now and then, the dock will suddenly shift back to my MacBook screen, but when I open up Displays to change this back, the white bar is still on the external monitor. So I have to drag it to the smaller screen, and then drag it back to the external monitor. It's a minor issue, obviously, but I've noticed that it has been happening more and more frequently and it's getting quite annoying. Perhaps there's something I've been doing unintentionally for this to happen? In Mac OS, the Dock shifts to that monitor where you made a downward gesture at the bottom (or where the dock is usually positioned). That is, if you moved your mouse pointer further in that direction (as if going out of screen), it's an indication that you are looking for the dock. So Mac brings the dock there! 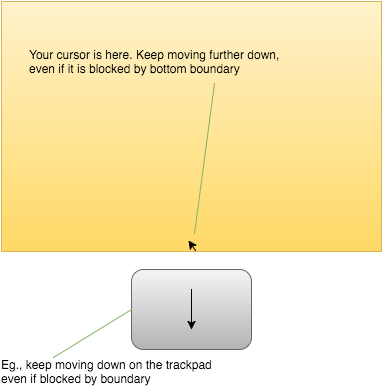 When cursor is blocked at bottom, moving the pointer further down brings the dock on that monitor. Can't use the words scrolling or dragging as you don't need to click/hold or use 2 fingers. It's just a normal mouse move. So the cause: Probably you are someone like me who likes to leave the cursor at the bottom of the screen on one monitor while watching movie or keyboard-only coding/development, and then accidentally swipes/moves down the mouse/trackpad. Happens with me all the time. Update: I just noticed that on the trackpad, it's not just a quick swipe. You have to swipe-down and hold on the track pad. It does nothing when you lift your finger quickly like a normal swipe gesture. if you have problems dragging the mouse due to resolution differences between monitors. Go to System Preferences > Dock > "Position on screen:" click "Left" and the doc will move back to the main monitor. You can then click "Bottom" and the doc will move to the bottom. You can summon the Dock on a different display by moving the cursor to the bottom of the desired display, and then continuing moving down. It may be possible that this is occurring when you inadvertently perform that action.